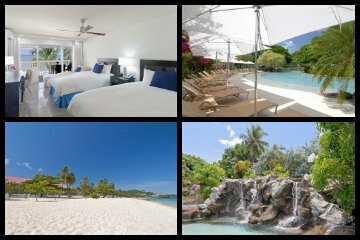 Best Grenada Resorts And Hotels include: True Blue Bay Boutique, Coyaba Beach, Petite Anse Hotel, Radisson, Blue Horizons Garden, Mount Cinnamon Resort & Beach Club, Siesta Hotel, Le Phare Bleu Marina, La Sagesse Hotel, Maca Bana. 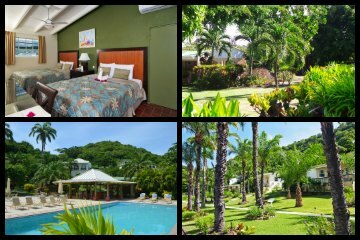 True Blue Bay Boutique Resort is a mid-range boutique Grenada resort that is perfect for families and travelers of all ages. This property is located on True Blue Bay which is on the southern tip of the island and has a relaxed atmosphere. This complex has only 30 rooms and suites which have a contemporary as well as bright décor. There are five categories which include True Blue, Tree Top, Indigo and Bay View rooms have varying locations near the playground, the pools, water’s edge and the garden. All rooms have a small kitchenette and private patio or balcony with views of the gardens, pools and True Blue Bay. Tower suites have a panoramic view of the bay and Waterfront suites offer split-level living. Suites are spacious with a separate living area, a kitchenette and views of the bay from a private balcony. Two-bedroom villas have plenty of indoor/outdoor living space, a kitchenette, a private plunge pool and views of the bay. Patrons receive a complimentary continental-style breakfast and the Dodgy Dock Restaurant and Lounge Bar is ideal for an ala carte breakfast or lunch as well as dinner. Other dining options involve a short taxi ride to Grand Anase Beach where guests can dine on Italian and French cuisine at La Boulangerie. Nightlife at this property includes live music on selected nights. Guests can revel on the beach which is a beautiful area of golden sand which is surrounded by a lush tropical landscape. Patrons can enjoy the complimentary non-motorized watersport equipment as well as the two Infinity freshwater swimming pools. This Grenada resort has a fitness center, dive center and full service spa. The property offers an on-demand kids club for children and there is also a nice playground. The resort is an ideal option for families who want a little bit of seclusion while enjoying the numerous activities that this property offers. 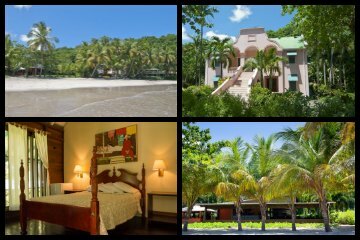 The Coyaba Beach Resort is a luxury low rise Grenada resort that is a great choice for travelers of all ages. Located on the southwestern coastline of the island along Grand Anase Beach, this property has an ideal location for guests to take advantage of everything this beautiful beach has to offer. The complex is situated on 5.5 acres and has a contemporary décor. The property is comprised of two-story buildings that house 80 identical rooms which feature spacious living areas, a private balcony or patio with views of the garden, pool or ocean. Dining options at this resort include Arawakabana Restaurant which serves an international buffet for breakfast, lunch and dinner and the poolside Carbet Restaurant serves an ala carte menu that features grilled cuisine for lunch as well as dinner. Patrons can find other dining options and nightlife along this fabulous beach area that includes live music at Umbrellas Beach Bar and a great evening atmosphere exists at Venus Restaurant and Sports Lounge. Guests are just steps away from the beach at this location and the onsite dive center can help with planning motorized and non-motorized watersport adventures. Patrons can enjoy the freshwater swimming pool that has a nice lounging deck which is surrounded by a manicured tropical garden. 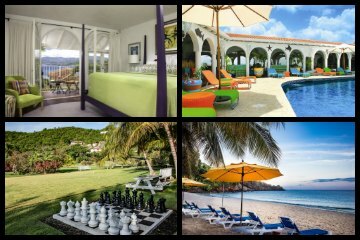 This Grenada resort contains a dive center, free Wi-Fi, fitness center, tennis courts and full service spa. With upgraded room amenities this property is perfect for those looking for luxury and easy access to everything the island has to offer. 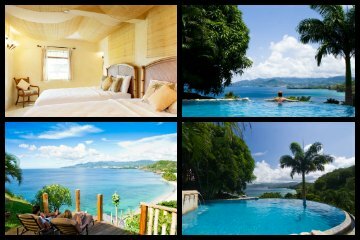 The Petite Anse Hotel Grenada is a small boutique Grenada resort that is situated on the northwestern tip of the island near the small town of Sauteurs. This upper mid-range property is somewhat isolated and travel time is over an hour to/from the airport. The boutique complex has a natural look to the surrounding tropical landscape and guests should not expect overly manicured gardens. The property has only 13 rooms which are located on a bluff overlooking the ocean. There are 11 cottages and two larger honeymoon suites that are attached to the main building. The décor of the rooms is fabulous with antique Victorian-style furniture that includes canopy beds, writing desks and chairs. All units have a private balcony with an ocean view. Dining options are limited with only one restaurant and bar which have a large veranda for viewing the ocean while you are enjoying an island cocktail or dining. There is not much if any nightlife at this property or other dining options within a short distance. The beach is golden sand and swimming can be challenging at this northern location. Limited Non-motorized and motorized watersport equipment is available for rent. There are several unique tropical hiking trails which help bring the real nature of this remote location to patrons. This Grenada resort has a nice freshwater swimming pool with an actual jungle feel. Other amenities include free Wi-Fi. The complex does not have a fitness center or spa or televisions within the units. This property has the right tranquil atmosphere for couples who are looking to reconnect with nature and relax in the tropical surroundings. The Radisson Grenada Beach Resort is ideal many types of travelers that wish to be near the many exciting attractions on Grenada. The complex is situated on the southwestern tip of the island ona quarter-mile stretch of Grand Anase Beach. This Grenada resort is formerly known as the Grenada Grand Beach Resort and was renovated as well as rebranded in 2013. This four-story complex has 229 rooms and suites which have a fresh modern décor. Normal sized rooms are available with private balconies and views of the beachfront or gardens. Executive beachfront rooms and one as well as two-bedroom suites have stunning beachfront views and more space for families. Dining options include three restaurants with ala carte menu service which include a buffet-style breakfast and an ala carte menu of tropical cuisine at the Tradewinds Restaurant or lunch at the Oasis Pool Grill. The Bamboo Restaurant offers lunch and dinner service with an ala carte menu of Italian, Asian and Caribbean cuisine. Libations can be found at three bars including the Sunset Beach Bar as well as the swim-up bar located in the massive 300-feet lagoon-style freshwater swimming pool that is complete with waterfalls. Activities are numerous on this stretch of beach with plenty of vendors renting motorized and non-motorized watersport equipment. There is plenty of nightlife along Grand Anase Beach which includes live music at Umbrellas Beach Bar. This Grenada resort has a fitness center, free Wi-Fi, tennis courts and full service spa. The property is ideal for those wishing to have either an all-inclusive or pay as you go format and although the property does not a kids club there is plenty to keep the children busy at this resort. 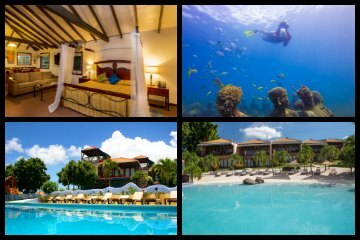 The Blue Horizon Garden Resort is a great choice for a mid-priced family-friendly Grenada resort. This property is located in the Grand Anase Beach area which is located on the southern part of the island. The complex is not situated directly on the beach and guests must walk five minutes before indulging in the golden sands and tropical landscape. The property has 32 all-suites with a lively Caribbean décor and several options for units that are sized for families. Studios are the smallest at 435 square feet with a kitchenette, private balcony and garden views. Larger one-bedroom suites range in size from 535 to 625 to 756 square feet with a private split level living area, full kitchen and a balcony that offer views of the gardens or ocean. Dining options include La Belle Creole Restaurant and Bar has excellent Continental West Indian cuisine for dinner with more traditional breakfast fare in the morning. The Aqua Pool Grill and Bar will satisfy your thirst and hunger during the day as well as offering an ala carte menu of grilled seafood in the evening. Patrons can venture off-site and dine at such favorites as BB’s Crabback for innovative seafood or Patrick’s Local Homestyle Cooking Restaurant which boasts Caribbean infused vegetarian dishes. Nightlife can be found steps away at one of the many beach bars such as Bananas Restaurant and Sports Bar which has live music most nights. Patrons of this Grenada resort have access to a more upscale chic hotel called Spice Island Beach Resort. Guests walking to the beach can use the complimentary non-motorized watersport equipment offered at the sister property as well as the fitness center, spa and other amenities. The freshwater swimming pool has a nice deck with ample seating for umbrellas and loungers. There is not an organized kids club but this mid-range Grenada resort has many things that appeal to families and the location is ideal. Mount Cinnamon Resort and Beach Club is the perfect Grenada resort for families and couples who are looking for all the comforts of home. 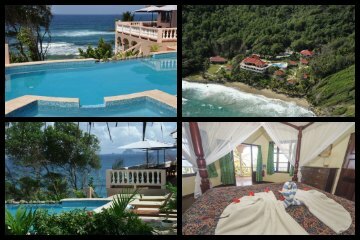 Located at Grand Anase Beach, this Grenada resort is situated on the southern tip of the island. The upscale complex has 21 villas and suites that have a smart Caribbean décor with nice furnishings. Villas range from one to three-bedroom split-level units with ample living space, a full kitchen and veranda with views of the tropical scenery or ocean. The Hacienda suite has a private garden with plunge pool, a full kitchen and two-bedrooms as well as a large living area. Guests can indulge in fine Caribbean inspired cuisine for breakfast and dinner at Savvy’s as well as enjoying lunch beachside at Savvy’s Beach Cabana. Patrons may also choose to venture off-site for dining options at restaurants like Le Papillion Café for fabulous French cuisine. Nightlife is limited but patrons can find a variety of evening activities along Grand Anase Beach at such places as Dodgy Dock Restaurant and Lounge Bar where guests can listen lo live island music. This Grenada resort has a private beach which is perfect for swimming or for guests to use the complimentary non-motorized watersport equipment. The property has a nice freshwater swimming pool which is surrounded by a lush tropical landscape. The complex has a fitness center, yoga center, assorted table games, tennis courts, free Wi-Fi and a full service spa. The resort has a Montessori Kids Club with organized activities for children 4 to 12 years of age. This property has a great family and couple atmosphere that is perfect for those looking for a luxury villa experience. 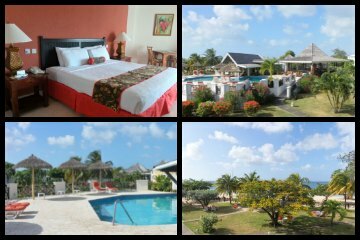 Siesta Hotel is the ideal lodging options for families and groups that are looking for a budget Grenada resort. Located within a five minute walk to the spectacular Grand Anase Beach, the high rise complex is located on the southern tip of the island. The simple décor of the rooms and suites offers value without sacrificing comfort. Rooms can be somewhat small with a private balcony and views of the pool, garden or ocean. One and two-bedroom suites are spacious with a separate living area, full kitchen and views of the island, tropical landscape or ocean. La Deliciosa Restaurant serves Creole and Caribbean inspired cuisine and is available poolside. Other dining options like Coconut Beach for seafood and Carib Sushi for fresh Asian delicacies. Nightlife is plentiful with live music at Umbrellas Beach Bar and the Beachside Terrace. The freshwater swimming pool is centered in the middle of the complex and has a small deck area. The property offers free Wi-Fi but does not have a fitness center or other amenities. 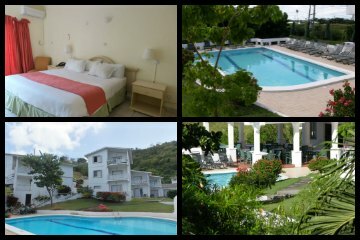 This property is a great option for travelers who are looking for a budget Grenada resort with easy access to the many amenities that Grand Anase Beach has to offer. Le Phare Bleu Marina and Resort is ideal for sailing travelers that want a nice marina to moor and take advantage of some land activities. Situated in Petite Calivigny Bay, this Grenada resort is located on the southeastern tip of the island and is a combination of a small boutique hotel as well as a full service marina which offers overnight to monthly mooring for boats. This modern décor low rise property has apartments and villas that range from one to two-bedroom units that feature a full kitchen, private balcony or patio and partial-sea, garden and beachfront views. There is a private two-bedroom villa that features spacious living areas, a full kitchen and a private garden with a freshwater swimming pool. The Deck Restaurant has innovative island fusion cuisine from an ala carte menu for lunch and dinner as well as a bar area with a fine selection of small plates at happy hour. The Lightship has recently reopened after an extensive remodeling and now features a bar and bistro with fresh light cuisine. Guests can indulge in other dining options nearby at places like The Beach House Restaurant which serves European and Caribbean cuisine. Nightlife at this property consists of live music on selected nights and there is a unique pizza evening on Tuesday nights. Patrons can explore the Caribbean Sea with the complimentary non-motorized watersport equipment and the onsite marina can help with planning any motorized watersport adventures. The complex does not have a freshwater swimming except in the private villas. This Grenada resort offers free Wi-Fi and there is a full service spa. This hotel and marina are a perfect choice for those travelers wanting a full service hotel while enjoying a stop-over on this beautiful Caribbean island. La Sagesse Hotel, Restaurant and Beach Bar is a luxurious boutique Grenada resort - one of the most romantic on the island! It's ideal for couples and romantic vacation - . This property is situated along the beautiful La Sagesse Beach which boasts golden sand and is located on the southeastern coastline of the island. This boutique hotel has a limited amount of rooms and suites that vary in décor from Caribbean beach-style to Victorian charm. Each unit is situated only 30 feet from the water’s edge along the beach. The Manor House is an architectural gem which has a selection of five rooms that are similar in size with rooms having a veranda and a garden or ocean view. The Caribbean Cottages are spacious with a large wrap-around veranda and the Ocean building has suites and duplexes with large outdoor living areas and sweeping views of the beach area. The hotel's La Sagesse Beach Front Restaurant has a delightful ala carte menu with local cuisine for breakfast, lunch and dinner. Nightlife at this complex is subdued with most people enjoying a few drinks at the beach bar. Patrons may also choose to take a short walk to the Gallery at Grenada Marine which serves a variety of fresh seafood. The beach area is perfect for guests to take advantage of the complimentary non-motorized watersport equipment and swimming is good at this location. This resort does not have a freshwater swimming pool nor does the property offer televisions and other electronic devices in the rooms or suites. Although, there is free Wi-Fi for guests. The La Sagesse Hotel is an ideal place for travelers looking for a beachfront hotel that offers plenty of solitude, romance and relaxation in a perfect tropical landscape. Maca Bana is a small luxury boutique resort which is ideal for couples and travelers looking for solitude and nice amenities. 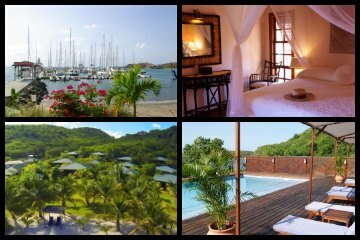 Situated along Magazine Beach, this Grenada resort is located on the southern tip of the island. The beach area at this property is quieter than most developed beaches on Grenada with a nice surrounding tropical landscape. The complex is set on a hillside on 2 acres of tropical gardens which overlook the Caribbean Sea. Accommodations have a modern beach décor and consist of only seven one as well as two-bedroom villas which have large indoor/outdoor living areas with a private deck that is furnished with a hot tub. Dining options are limited to the Aquarium Restaurant which has locally inspired cuisine from an ala carte menu for lunch and dinner. The restaurant also hosts themed nights with live island music. Guests can walk to The Beach House Restaurant but will need to take a short taxi ride for other dining selections. Patrons can enjoy in-room cooking with the full kitchens and there are plenty of nearby grocery stores with provisions. Nightlife at this resort is limited and many guests are satisfied enjoying libations at the beachfront bar. The beach area has plenty of opportunities for guests to adventure in the ocean with complimentary non-motorized watersport equipment, although swimming can be challenging at times. The complex has a small Infinity freshwater swimming pool which overlooks the oceans. This Grenada resort offers free Wi-Fi but does not have a fitness center or spa. The relaxed atmosphere and the privacy of the villas is perfect for couples as well as families that are looking for a luxurious resort.